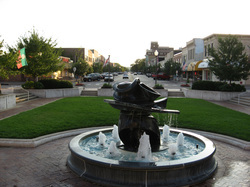 Manhattan is the eighth largest city in Kansas with 52,281 people and a metropolitan area of 130,240, the fourth largest in the state. The city is also home to Kansas State University which has an enrollment of more than 24,300 students, Manhattan has the strong feel of a college town combined with a smaller city feel. For more information about Manhattan, please visit the Manhattan Convention and Visitors Bureau website.